As the price of apartments continues to fall, you might be thinking about buying one. When you do, you will need to furnish it – and a modular sofa is the perfect sofa for your new home! A small apartment in the city centre is the perfect place to live when you buy your first home. It will be cheap, conveniently close to public transport and probably close to work as well – what’s not to like? Small apartments also mean that you don’t need to buy big pieces of furniture. Large dinner sets and couches can take up almost all of the space in your living room. You will still need a couch though, so why not get a modular sofa for your apartment? These two modular sofas are ideal when you don’t have a lot of room. They will leave you with plenty of space to use for other furnishings, and they generally look pretty nice as well. They also complement a small four seater dinner table and chairs. A TV on top of a small cabinet will be ideal to put against the wall facing your couch. As well as giving you the storage space that is vital to avoid cluttering your new apartment, this will be the most practical place to put a television set anyway. When you buy your modular sofa you might as well get some bedroom furniture as well. A bedside table is crucial for storage space, as is a good sized wardrobe. You just need to remember to leave room for your bed! What style of modular sofa you get will depend on the décor of the rest of the apartment. If the rest of your furniture is fairly minimalist, or has a lot of wooden surfaces, then black leather is probably the way to go. If, on the other hand, you have a colourful apartment with bright wall hangings and patterned furniture, then a colourful fabric or linen covering could be perfect! You can even get fun and colourful patterned modular sofa, which are great for an apartment with more eclectic furnishings. If your apartment is generally white (as in white walls and carpet) then you can find a nice colourful modular sofa to give it a bit of character. If you get bedsheets of the same colour then you can have a theme going that will impress any visitors – without needing to buy anything that isn’t a necessity! Remember that most of the furniture in your apartment should be dual purpose. This means that your dining chairs can also be used as seating when you have visitors, your table should be able to be used as a workspace and you should make sure that your coffee table has storage room either underneath or inside it. Your loveseat can fit the dual purpose trend if you are able to use it both for relaxing and entertaining. For example, you can curl up on it to watch TV on a rainy day and then move it to a more central part of the wall when you have friends around. Having a coffee table either in front of or next to your loveseat is also a good idea. This will allow you to eat in front of the TV (which we all do from time to time) as well as give you somewhere to rest your drinks if you are with friends. A good loveseat can pull your living room together, without taking up too much space. 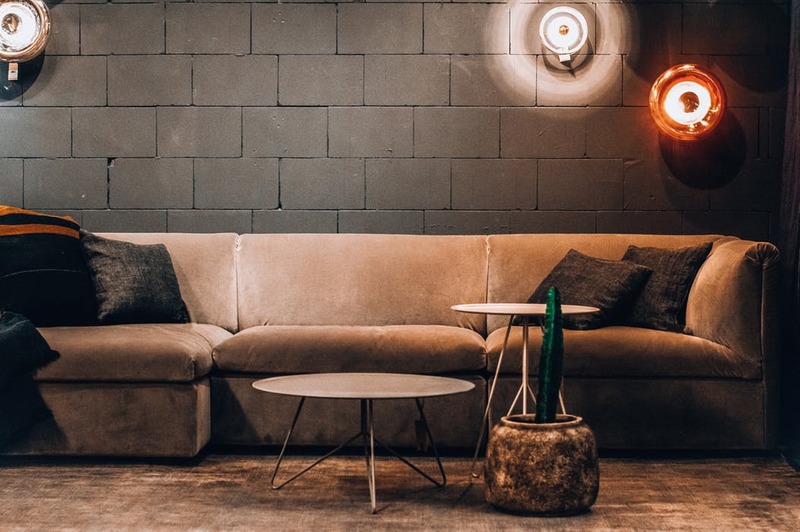 A full on sofa or couch will probably be too big for your first apartment, while anything smaller won’t have enough room for you to entertain guests.